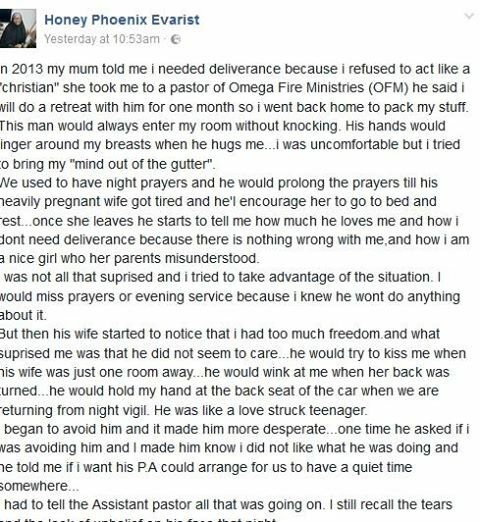 A Facebook user, Honey Phoenix Evarist shared this story last year about how a Pastor of Omega Fire Ministries allegedly sexually assaulted her in 2013 after the mum took her to the pastor for not acting like a Christian. In 2013 my mum told me I needed deliverance because i refused to act like a "christian" she took me to a pastor of Omega Fire Ministries (OFM) he said i will do a retreat with him for one month so i went back home to pack my stuff. This man would always enter my room without knocking. His hands would linger around my breasts when he hugs me...I was uncomfortable but I tried to bring my "mind out of the gutter". We used to have night prayers and he would prolong the prayers till his heavily pregnant wife got tired and he'll encourage her to go to bed and rest...once she leaves he starts to tell me how much he loves me and how I dont need deliverance because there is nothing wrong with me, and how I am a nice girl who her parents misunderstood. I was not all that suprised and I tried to take advantage of the situation. I would miss prayers or evening service because I knew he won't do anything about it. But then his wife started to notice that I had too much freedom. And what suprised me was that he did not seem to care...he would try to kiss me when his wife was just one room away...he would wink at me when her back was turned...he would hold my hand at the back seat of the car when we are returning from night vigil. He was like a love struck teenager. I began to avoid him and it made him more desperate...one time he asked if I was avoiding him and I made him know I did not like what he was doing and he told me if I want his P.A could arrange for us to have a quiet time somewhere... I had to tell the Assistant pastor all that was going on. I still recall the tears and the look of unbelief on his face that night. The assistant did nothing about it...but advised me to pack my stuff and leave before things get out of hand. But I couldnt leave because the "retreat" was not over. One night at the night vigil at OFM headquaters in Auchi I went to confide in a friend...and my father's driver overhead everything and he told my dad once we returned to Abuja. The sad part about it all was that my parents called the pastor and his wife to ask them...instead of me. And they heaped it all on me. They said I have been misbehaving because I am tired of the "retreat" and I sleep during prayers, I don't go to the evening services and I have come up with accusations because I want to go. The good thing was that I moved back home. Till today I wonder what sort of brains the pastor's wife had in her head.